It was my first try of Pamela's Gluten-Free Bread Mix. It's easy and makes a good size loaf. This is great sandwich bread and the consistency is impressive. Very much like a white wheat loaf. It would probably make wonderful garlic bread as well, as it has that doughy texture. It tastes sweet and you can taste the tapioca flour, but it goes well with savoury or sweet spreads and toppings, and is quite versatile. It's best frozen after a few days in individual slices to be taken out when needed. Pros: Easy to make. Great sandwich bread for picnics and packed lunches. 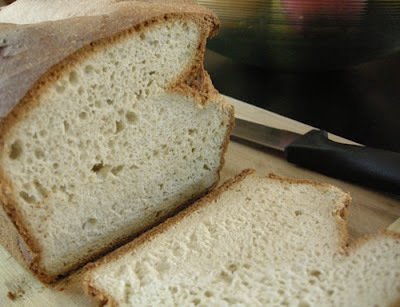 Good alternative to wheat white bread. Cons: It's not organic. It contains sugar. It's low in fibre and protein. It has a tree nut allergy warning.